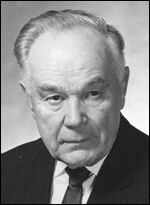 Petrenko, Petro [Петро Петренко] – hydraulic engineer, active in community affairs; born on 27 June 1898 in Vinnytsia (Ukraine; at that time – Podillia gubernia, Russian Empire); died on 2 August 1989 in Mississauga, Ontario, Canada; buried in the St. Volodymyr Ukrainian Cemetery in Oakville, Ontario. Petrenko attended a parish church primary school in the village of Klopotivtsi (now in the Derazhnia raion, Khmelnytskyi oblast) until 1908, and then a Realschule secondary school in the town of Bar in the neighbouring raion. In 1914 he enlisted in the Imperial Russian Army. In 1916 he graduated from the Odesa military school with the rank of ensign and was posted to the 10 Army Corps. From August 1917, after the Ukrainisation of the Corps, he remained with it on the Romanian front until it was demobilised in February 1918. Returning to Bar, he organised a platoon of Free Cossacks in the city. He later enlisted in the army of the Ukrainian State and completed an officers’ training course (September 1918). After the re-establishment of the Ukrainian People’s Republic (UNR) in December 1918 he joined the UNR Army and took part in various front-line actions. In late 1919 he contracted typhoid fever and, after recovering, returned home. In the spring of 1920 he re-joined the Army. From November 1920 he was interned with the Army in Poland, in camps in Łańcut, Strzałkowo and Szczypiorno, where he engaged in various cultural pursuits, including painting. In Szczypiorno he co-founded an art studio whose members sold their works in various parts of Poland. In May 1924, at the same camp, he passed an external examination covering the seven-year Realschule curriculum. After the liquidation of the internment camps in 1924, Petrenko illegally crossed the Czechoslovak border and in November of that year became a student in the Department of Hydraulic Engineering at the Ukrainian Husbandry Academy in Poděbrady. In 1925 he was elected to the parish council of the local Ukrainian Autocephalous Orthodox Church and served as parish elder. In April 1929 he defended his dissertation for qualification as a hydraulic engineer. He worked as an engineer for three years in Hradec Králové, and then for seven months in Nitra, Slovakia. After returning to Poděbrady he was involved in the preparation of maps of Ukraine for the Ukrainian pavilion at the 1933 World’s Fair in Chicago. He then moved to Transcarpathia where, from September 1933, he worked as a teacher in a primary school in the village of Neresnytsia (Tiachiv raion). After gaining a teaching qualification at a college in Uzhhorod he taught mathematics, technical drawing and art in the “civic” (lower secondary) school in Neresnytsia. During the struggle for the independence of Carpatho-Ukraine (1938-39) he became a district commander in the Carpathian Sich defence organisation. Following the March 1939 Hungarian occupation of Transcarpathia, Petrenko was forced to flee to Romania, from where he subsequently returned to the Czech lands (at that time the German Protectorate of Bohemia and Moravia). The local employment office sent him to Hamburg, Germany, where he worked as an engineer, initially for the Dyckerhoff & Widmann company, and then for the Hanover water transportation authority. After obtaining an engineering degree in Berlin, on the basis of his earlier qualification, he worked as an engineer in the former Austria and then on the construction of water storage tanks in Racibórz, Poland. In 1944, as the German-Soviet front line advanced, he was mobilised to work on a defence line in the Kielce-Kraków area. By the spring of 1945 he was in Soviet-occupied territory, from where, after the end of the war, he crossed into the British Zone of Occupation of Germany. For a time he worked on the strengthening of the Edersee Dam near Hann. Münden, then moved to a displaced persons camp in Göttingen. In September 1947 Petrenko emigrated to the United Kingdom as a European Voluntary Worker. For the first six years he worked in textile mills, initially in Pudsey, near Bradford, and from 1951 in Bradford itself. After the formation of the Society of Ukrainian Engineers in Great Britain (January 1951) he became chairman of the local branch of the Society. He also became active in the Ukrainian Autocephalous Orthodox Church in Great Britain (UAOC-GB), as head of its Yorkshire regional council (from 1948), head of the local branch of the Brotherhood of Saint Michael the Archangel, deputy head of the Bradford parish council (end of 1951 to February 1954), and a member of the UAOC-GB General Church Council (January 1951 to December 1952). In February 1954 he moved to Rugby where he worked as an assistant engineer for the English Electric Company (initially on water turbines and later on steam turbines) until his retirement in 1968 at the age of 70. On moving to Rugby he became active in the UAOC-GB parish in neighbouring Coventry: in 1956-62 he was a member of the parish council (head of the council until 1959), and until 1964 he conducted the parish choir. At the 1956 Council of the UAOC in the Diaspora, held in Karlsruhe, Germany, he was elected a member of its High Council (from which he later resigned). In 1962 he was re-elected to the General Church Council of the UAOC-GB, of which he remained a member until 1970. He was the author of several articles on historical topics in the Vidomosti journal of the UAOC-GB, and also painted icons and decorated various religious artefacts (icon cases, epitaphioses, ceremonial crosses etc) for a number of UAOC-GB parishes, particularly in Bradford and Coventry. In 1972 he was appointed leader of the British section of the Ukrainian Cossack Brotherhood veterans association, and subsequently its European leader. In 1976 Petrenko emigrated with his family to Canada where he settled in Mississauga, near Toronto. He continued to be active in Ukrainian community life, particularly in the Ukrainian Cossack Brotherhood, serving as the association’s deputy leader and a member of its Honorary Council.